Milled from a single piece of aluminum much like their Legend phone (only, with some plastic this time 'round), the Desire Z is as far removed from HTC's previous slide-out Android, the G1, as you could possibly hope. 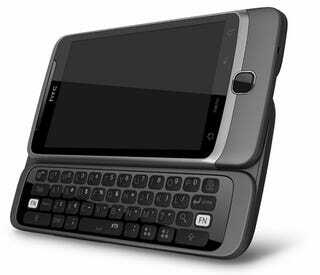 When its first leaked shot appeared online, many doubted HTC would create a phone with only four rows of keys. Yet that's what keeps the phone so thin, with the spring-loaded mechanism "Z hinge" drawing the keys under that 3.7-inch touchscreen. Dedicated quick keys, which we first saw on the G2, make accessing favorite shortcuts even easier—though some will wish HTC hadn't removed the dedicated row of numbers (now, only available with a press of the "alt" key, or on the virtual keyboard). Is This HTC&apos;s Android-Sliding Vision Phone? HTC is swapping AMOLED screens for Super LCD panels, citing limited supplies from manufacturer Samsung, plus better battery performance as being the trigger behind their move. A capacitive touchscreen, the Desire Z has a WVGA 480 x 800 resolution. Is HTC Replacing AMOLED for S-LCD Screens So Bad? Under the hood, an 800Mhz Snapdragon processor is ticking away, same as the US' T-Mobile G2, whose Snapdragon chip is clocked at 800Mhz too. 1.5GB of internal memory, and with a microSD card, the memory can be expanded to 32GB. The 5MP camera isn't quite what we were hoping for after seeing the Desire HD's 8MP sensor, and it's also missing the Desire HD's dual-flash, favoring instead a single LED unit. But, you know, it's still fantastic—I guess we've just been spoiled after seeing what HTC can do with bigger, badder sensors. Mind you, it still shoots 720p video, which is most generous of HTC—you'd think they'd save it for their "HD"-branded phone. Unlike the G2, the Desire Z will be loaded with Android 2.1 for now, with Froyo becoming available later through a firmware update. The usual connections have been included, such as GPS, A-GPS, Wi-Fi and HSDPA connectivity, with the exclusive network being Vodafone in Europe (at the very least, for now). The phone measures 119mm x 60.4mm x 14.16mm and weighs 180g. More details when we get 'em. To see hands-on photos of the Desire 7, head on over here. UPDATE: It will actually launch with Froyo. Hurrah! LONDON, UK – September 15, 2010 – HTC Corporation, a global designer of smartphones, today unveiled a new HTC Sense experience with the new HTC Desire HDTM and HTC Desire ZTM Android-based smartphones. The new HTC Sense experience continues HTC's strong focus on the customer, placing people at the center by simply making its phones work in a more personal and natural way. HTC Sense introduces a number of key innovations including a series of connected services called HTCSense.com that enhance people's mobile experience on HTC phones. "We're excited to be taking the HTC Sense experience beyond the phone to a whole new level with a series of connected HTC services we call HTCSense.com," said Peter Chou, CEO of HTC Corporation. "Our customers will value the holistic approach we're taking to enhance their mobile experience. This customer-first philosophy has resonated with people buying HTC phones and this drives us to continue introducing new innovative smartphones like the HTC Desire HD and HTC Desire Z." "As a key Android partner and smartphone brand, HTC continues to bring new innovation to the platform," said Andy Rubin, VP engineering at Google. "Android is about choice and the new HTC smartphones continue to provide customers with powerful choices and flexibility." The new HTC Sense experience offers a variety of enhancements that improve how people capture, create, share and access multimedia content. With a newly created camera experience, people can record HD videos or capture and edit images with a variety of fun camera effects. With HTC Locations, a new differentiated online mapping experience, people have instant, on-demand mapping without download delays or incurring mobile roaming charges. HTC Sense also includes a new integrated online e-reading experience utilizing a new e-book store powered by Kobo and a new, mobile-optimized e-reader that includes the ability to highlight, annotate and quickly search for definitions or translate unfamiliar terms. With the new HTCSense.com service, people can simply manage their mobile phone experience from their HTC phone or personal computer. For example, people can easily locate a missing phone by triggering the handset to ring loudly, even if it is set to silent, or to flag its location on a map. If the phone's been lost or stolen, users can remotely lock the phone, forward calls and texts to another phone, send a message to the phone to arrange its return or even remotely wipe all personal data from it. HTCSense.com makes it easy to setup a new HTC phone or access archived mobile content such as contacts, text messages and call history from a PC browser. People can also customize their phones with exclusive HTC content like wallpapers, HTC scenes, sounds or plug-ins. HTC Desire HD showcases outstanding multimedia content with its bright 4.3" LCD display and Dolby Mobile and SRS virtual sound and is the first to be powered by the new 1GHz Qualcomm 8255 Snapdragon processor. The HTC Desire HD enables 720p HD video recording and includes an 8-megapixel camera with dual-flash. Building on the unibody heritage of the HTC Legend, the HTC Desire HD is sculpted from a block of solid aluminum and exudes the air of quality and strength that HTC has come to be known for. It also includes the new HTC Fast Boot that enables people to quickly make a call or check emails by shortening the time taken to complete the power-up sequence. For people constantly on the go, HTC Desire Z makes it quick and easy to stay connected with friends on Facebook and Twitter or with colleagues and customers at work. HTC Desire Z features a unique ‘pop hinge' that opens to reveal a QWERTY keyboard for fast, convenient typing. HTC Desire Z's keyboard also includes a variety of keyboard shortcuts and two customizable keys for providing instant access to common functions without the need to open menus. HTC Desire Z also includes 720p HD video recording and a 5-megapixel camera with automatic flash. It is the first phone to utilize the new 800MHz Qualcomm 7230 processor for improved performance and battery life and also includes HTC Fast Boot. The new HTC Desire HD and HTC Desire Z will be broadly available through mobile operators and retailers across major European and Asian markets from October 2010 with the HTC Desire Z shipping in North America later this year.